"Green salad that is especially pretty to serve during the Christmas holidays." Preheat oven to 375 degrees F (190 degrees C). Arrange almonds in a single layer on a baking sheet. Toast in oven for 5 minutes, or until nuts begin to brown. In a blender or food processor, combine the vinegar, oil, cranberries, mustard, garlic, salt, pepper, and water. Process until smooth. 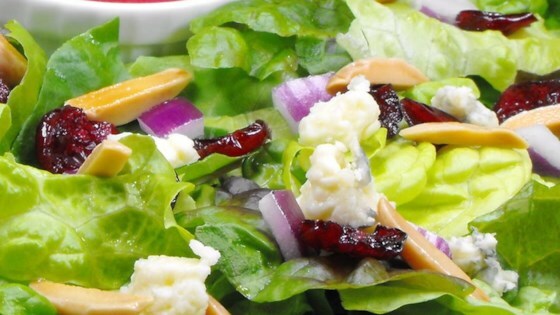 In a large bowl, toss the almonds, onion, blue cheese, and greens with the vinegar mixture until evenly coated. Very tasty - I added crumbled Gorgonzola cheese & a few "Craisins" with sliced chicken strips on top for a twist.